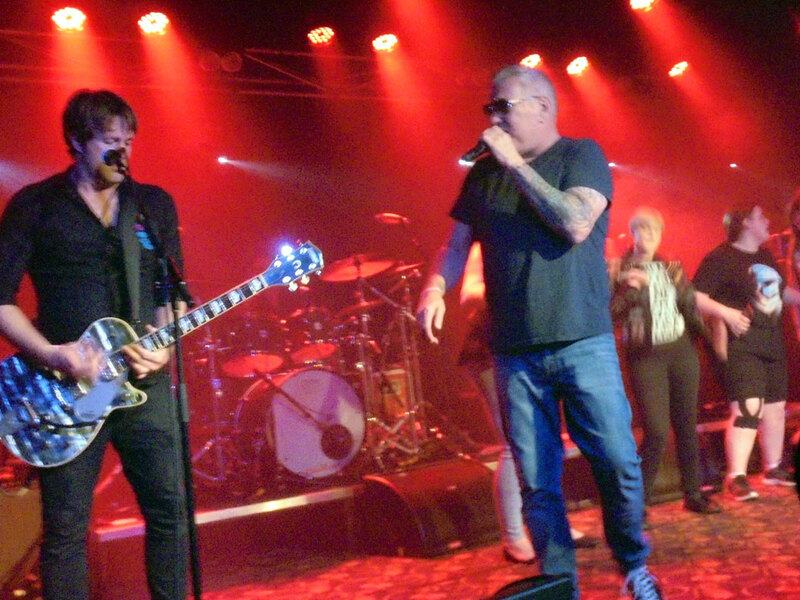 Last time Smash Mouth visited Australia, their tour was postponed, but when they finally made it back to the HiFi in 2013, it was one of the best shows of the year, though painfully under-attended. In all, there must have been less than fifteen people, most of them rockabilly types dancing stylishly whilst I jumped around like a lunatic. So it was a relief tonight to find the Croxton Bandroom respectably full. Area-7, apparently now comprised of eight members (a fact which frontman Stevo may have explained at some points) were just taking the stage, and whilst the audience was surprisingly appreciative of a support act, it wasn’t until the band played Second Class Citizen that the front row started to really dance. 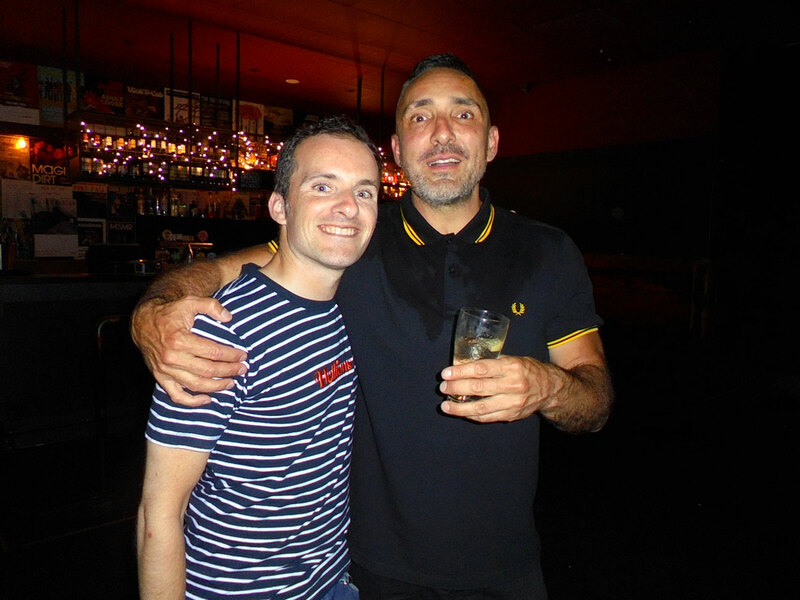 It was clear that there were some Area-7 fans who had come out early: a guy who was praised by the band for wearing a Specials t-shirt – which I later referred to as a Madness t-shirt, and was actually merchandise from The Beat – told me he and his partner had come just to see Area-7. On stage, Area-7 were as lively as ever. 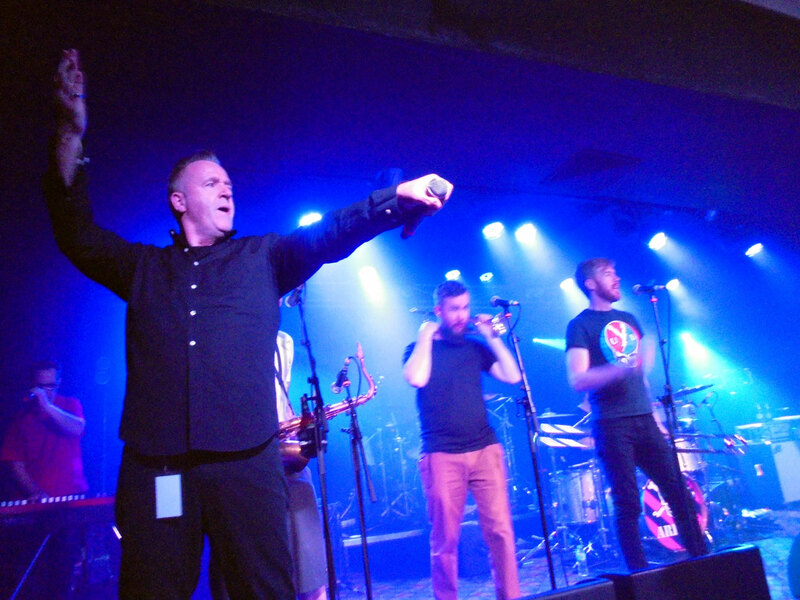 The horn section, as usual, bore their brass like true rockstars, and Stevo tore around the stage and into the audience. Songs like No Logic were played to pitch-perfection by a band who are clearly still enjoying their occasional live jaunts. A cover of The Angels’ Am I Ever Gonna See Your Face Again managed to get everyone singing, with even the security guard at the side of stage caught dancing, though was probably only brought out as a part of a support set and highlighted the absense of some of the band’s own songs not played, like Himbo or Dodgy Mate. I couldn’t help but compare it to Mach Pelican’s cover of the song. An extended rendition of Start Making Sense was the set highlight before Bitter Words saw the band leave the stage, with mentions of upcoming appearances at the Hotter Than Hell nostalgia festivals sounding very tempting. As the lights dimmed, Smash Mouth’s members took up positions behind their instruments to the riotous applause they deserved but missed during their 2013 visit. Electronic fuzz was piped into the venue, and the players struck different notes, hinting at what was to come, and sounding very Astro Lounge, hinting at an opener of Who’s There. As they seemingly tuned their instruments, frontman Steve Harwell joined them to even greater applause, taking the time to visit each band member at their post before taking his position behind the microphone to open with Can’t Get Enough Of You Baby. His trademark sunglasses in place, he didn’t leave that spot much for the rest of the set, in stark contrast to Area-7’s own Steve, who spent their set energetically bounding around the stage. Perhaps to compensate for his own lack of dance moves, Steve wasted no time in extending an invitation to any interested women to join him on stage to dance. It was immediately accepted by a throng of enthusiastic dancers, whose enthusiasm seemed to wane when they noticed they were not being shown off the stage, and who didn’t seem to know too many of the songs (despite arriving on the stage right in time for one of the set highlights in The Foz.) They seemed pleased to be able to sing along to the War cover Why Can’t We Be Friends? from the group’s first album, a song which, along with Road Man demonstrated how well Smash Mouth can play their reggae-influenced songs life. The highlight of the set was another old song, Stoned, in a set entirely made up of old songs – I don’t own the group’s 2012 Magic album but would have liked a sample. An unexpected cover of the Kinks’ You Really Got Me was played well and closed out the main set. An extended drum and organ battle opened the encore, and could have lead to anything – it kept hinting at 105 or Radio – before evolving into the distinctive key strikes of the group’s cover of I’m A Believer. Closing predictably, but not disappointingly with All Star the group left the audience satisfied, and to the applause and reception they deserved during their previous tour. An woman had started talking to me at the bar whilst I waited for my drink to be mixed. I asked her what she meant. I told her I wasn’t, and thanked the bartender, and the Heavens, for my drink being ready. I refuse to believe I’m too old to attend a Hellions show of my own volition, despite it being suggested at each one I’ve been to. Luckily, the lack of support bands didn’t mean an audience that needed time to warm up. As soon as the band emerged on stage, the crowd erupted, even as the band started with a string of new material that only those who had pre-ordered the album would be likely to be familiar with. It was suitable to open with new songs – typical chorus-verse-chorus structure made their own with rips of duelling guitar and building harmonies – and satisfying to see the early enthusiastic reaction, which only built further as the radio-favourite X (Muah) from nine months earlier was brought alive. Later, another new song, Get Up! would hit with a surprise burst of funk-rock bass slaps reminiscent of nothing so much as a Red Hot Chili Peppers song. Whilst the launch of songs from Rue saw Hellions exhibit a carefully rehearsed craft, the older songs played tonight took on a new life. Songs from Opera Oblivia, in particular, were played with a casual ease, allowing them to be heard in a new light, free of the heavy production of their previous touring incarnations. Oddly, though, weird gimmicks were employed, namely a confetti cannon to accompany the closing Thresher, which would have been as crowd-pleasing had it been played in the same raw style as other songs of the era, without any theatrics. Nevertheless, the show had an energy and variety one doesn’t normally find at heavy rock nights, and, though launching the new record, it was nice to be taken back to early records, and to be a part of a heavy music audience who know how to dance without being brutal to the point of causing distress. Daniel Johns remarked at Silverchair’s career being spent in darkness until the release of Diorama, when he said the band relished the chance to finally paint in colours. Similarly, Rue feels like Hellions experiencing some relief and enjoying the simple pleasures life has to offer after the outrage that ran beneath the surface of Opera Oblivia. Immediately lighter and more melodic than anything we have heard from Hellions in the past, Rue opens impressively with Panic! At The Disco vibes during Odyssey, setting a playful tone that will follow through the album. Even the initial mediocre leading single X (Muah) somehow finds new life when played within the context of the album, and the more impressive follow-up single Smile fits equally as well. Lyrical leitmotifs, including referencing influences, have been continued from previous albums (to the point of reworking the last album’s Lotus Eater‘s chorus exactly for The Lotus) suggesting a stream-of-consciousness writing style, or perhaps that a concept album-esque story is running through all of Hellions’ work. References to aging in the album’s highlight Furrow and 26 seem to confirm an Adele-style naming convention to the band’s numbered song titles. 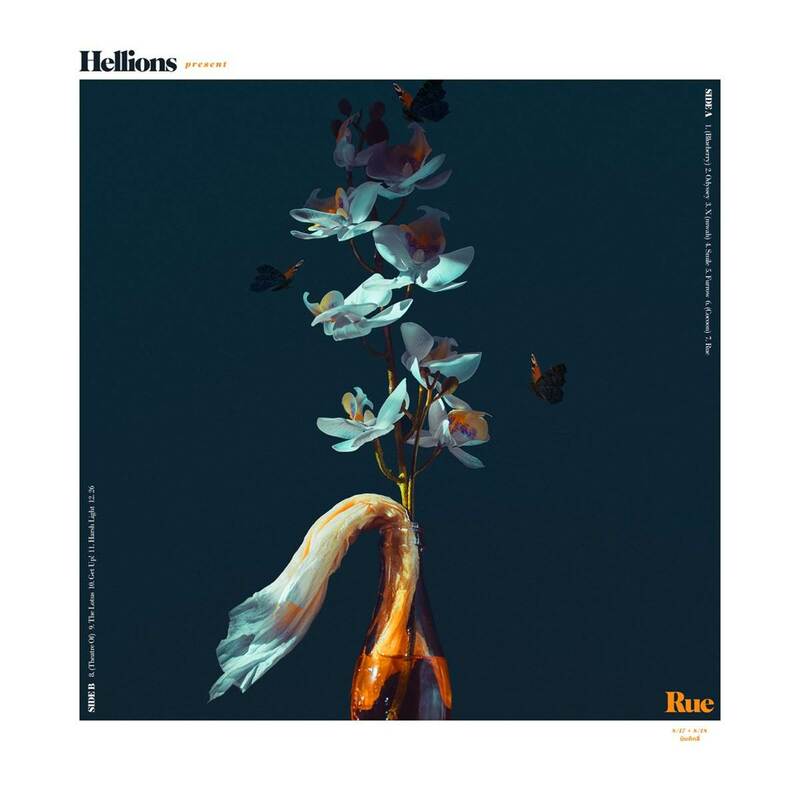 Rue is an album that sees Hellions continue the trademarks we’ve known from them since the days of Die Young like thumping builds to dramatic crescendos and frantic raps breaking into duelling guitar choruses, along with the thoughtful production added during Opera Oblivia. The result is a much different, but distinctly Hellions record that is just as worthy of the praise that was offered to their previous work. And just like previous works, it doesn’t wear out upon repeated listens. Climbing the stairs to the Forum’s cloakroom, I felt exhaustion set in. This had been a big week. Between Splendour In The Grass sideshows and Open House Melbourne, every night had been one with plans. It had seemed almost a blessing in disguise when Chromeo’s show was cancelled due to exhaustion. One night off in the week would probably be a good thing. The bad news for tonight’s acts was that getting me motivated at the tail end of Splendour Week could prove a difficult task. Luckily, the combination of the Forum’s trademark themed cocktails (tonight serving ‘Broken Machines’ and the superior ‘Trip Switch’ – ‘Honey Whiskey’ must have been too obvious) and the opening strains of the support was enough to revive some energy. Sounding like Supergrass creating a King Gizzard and the Lizard Wizard tribute show, the group played an accessible kind of fuzz-rock through a fog on stage so thick the band looked like they’d been transported to a 1990s grunge video clip. Whilst quite a different kind of sound to the headliner, the pop-rock proved to be crowd-pleasing and a nice warm up for the main part of the night. From the cloudy darkness on stage rang out what could have been a last minute sound check of the drum kit, but was suddenly realised as a prolonged opening to I Was Just A Kid. As the lights lifted with the chorus, we saw the band clad in matching black, with singer Conor Mason leaning slightly into the microphone, hopping a little as he sang. Conor and the band proved to be versatile showmen live, moving from soulful wailing to unexpected, almost Queens Of The Stone Age-esque power riffs. With little to say between songs, we were teased instead with creepy interludes, the best of which seeped into a bubbly rendition of Particles. Whilst most of the set was played pitch-perfect, almost indistinguishable from a CD recording, highlights were when the band deviated and expanded upon the songs, like a particularly bass-heavy rendition of Trip Switch. Only two albums into their career, what Nothing But Thieves brought to Melbourne was a lot of variety, seemlessly transitioning from ballads to rock, yet never leaving any band member awkwardly on the sidelines. However, the best moments were those when the band built dramatically, like in Broken Machine and especially Soda where even the Forum itself seemed to join the band, raising the lights to meet the song’s crescendo. Nothing But Thieves have been good to this city, already making the long journey from the UK several times, but after a quality performance competing against a week of others, the audience were left already anticipating the next visit. ‘Just bulldoze it now!’ shouted a woman in the queue outside Festival Hall, a commentary on recent reports that young Mr Wren feels like getting out of the entertainment venue business and selling up, and the mixed feelings amongst music fans surrounding it. Tonight, Festival Hall’s doors were due to open at 7pm, and passers-by already struggled to weave through the dense crowds waiting to enter on Dudley Street. The process was long, delayed by security staff checking the identification of even the most obviously overage patrons attempting to access licensed areas, and by the policy this evening of thoroughly searching all handbags, even those more accurately described as small purses. By 7.45, it was my turn, and I eagerly clutched my ticket, my drivers license ready. Before I could hand it over though, I was pointed away, ordered to the cloak room: jackets, along with bags, also needed to go to the cloak room. With an icy wind cutting through Melbourne on the night of what weather forecasters had been calling an ‘Arctic blast,’ the line of patrons clutching the jackets and bags deemed contraband is even more extensive than that to the venue itself. Even bags and jackets being left in the cloak room were being searched. It would be 8.30pm before I made it to the front of the line and the cloak room window. The Splendour-sideshow double-headliner seemed an odd pairing when it was announced, though not an unwelcome one, with the only obvious link between MGMT and Franz Ferdinand being that both sing songs about someone named Michael. MGMT were first up, though with their scheduled start time of 8 o’clock, I had to settle for listening to Little Dark Age through the wall, my ear pressed to the cold Festy bricks. Entering part way through an obviously crowd-pleasing Time To Pretend, the similarities between this band and the Flaming Lips dawned on me for the first time. Of course, it could have been an illusion created by the MS Paintbrush animated backdrop the band were playing against, or by the inflatable Little Dark Age mascot looming at stage right. For the remainder of the set, it was those Oracular Spectacular songs which drove the full house crowd wild, though they were the songs played stiffly and with the least enthusiasm by the band. By contrast, new songs Me and Michael and TSLAMP saw the key duo adding creative guitar and synth flourishes, and even the touring guitarist, who had been hiding at the back of the stage dressed in a red jumpsuit, seemed to burst to life. A cloaked figure who had been lurking ominously beneath the balloon creature, suddenly brandished a guitar, as if plucking it from mid air. On the other hand, singing one of the new album’s highlights, She Works Out Too Much, on an exercise bike seemed like a confusing in-joke which only distracted from the rest of the quality performance of newer material. An extended rendition of Kids had the alcohol-drenched floors threatening to break under the force of the audience bouncing, and was complimented by a ravey interlude, and Congratulations served as a closing cool-down, though was sadly missed by many as the floor emptied of those who had apparently only wanted to hear charting singles. During the intermission, the queues from outside were reformed for both bathrooms and bars, ensuring I partook in neither whilst the elaborate props were removed from the stage and replaced with a classic rock set up for Franz Ferdinand. Introducing the band with his iconic, signature drumming style, Paul Thompson opened The Dark of the Matinée, as the rest of the band sauntered before a backdrop of solid colours, a stark contrast to the elaborate staging of MGMT, appearing in silhouette like the old iPod commercials. Meanwhile, the nature of the audience had shifted in one song. I didn’t see anyone who had surrounded me at the front of the stage for MGMT, though some clearly remained, cutting shapes awkwardly as creative renditions of new songs like Always Ascending were teased and remixed live for us. It was a set that drew heavily from both the early stages of Franz Ferdinand and the current record, with new live twists given to both sides of the spectrum. After Finally took on a disco flavour, we were treated to a slowed down, late-night version of Walk Away. Alex Kapranos has grown into a formidable frontman, band uniforms a thing of the past, alternating between stalking the stage like Jarvis Cocker and enthusiastically slinging on a guitar from one song to the next. His energy rolled onto the audience, helping even those staying only to ensure value for money after paying for MGMT would join in for sing-alongs to singles like Do You Want To and Take Me Out. After a powerful and extended closer of This Fire, the double headline nature of the show started to feel like a curse: the short sets had left so many more songs unplayed from each band. Franz Ferdinand had put on one of the live sets of the year, and MGMT had had their moments, but Festival Hall, at close to capacity, seemed unworthy of the performances. As much as it is a shame to see venues closing around town, maybe it is the right time for Festival Hall, since I was left wondering how the show might have been had it been at Margaret Court Arena instead. It was a busy day of events in Melbourne. The Download Festival was making its debut at the Showgrounds, and as much as Daniel Ricciardo might have enjoyed seeing some heavy music, he would probably have struggled to find an excuse to get out of the Grand Prix. Meanwhile, in Frankston, 21st Century was sold out had filled up early. A large section of the audience seemed to have come out to see opener Osaka Punch, apparently alerady intoxicated and lining the front of the stage. Above them, on stage, the band appeared to have matched their audience’s intoxication, and were bounding around with what seemed like little thought. Silly antics ensued, but, when the band focused for some instrumental songs, they shone. Their closing instrumental, in particularly, literally stopped me in my tracks when I was about to give up on the performance. It would be good to see the band’s carry the dense, varied sound of that instrumental closer through a whole set. Main support Rival Fire perhaps did not excited those who had come early for Osaka Punch, but played an impressive set. Launching into pop-rock that fit between the opener and headliner well, the frontman sounded at times like Ian Kenny and at others like Mike Sinoda, and along with the rest of the band, put a positive energy into their performance, leaping around the stage, gold chains swinging wildly. Some people might have found it tacky, but Rival Fire played a self-referential introduction song that was a highlight of their set. The group’s best moments where those where the singer ducked away to play an instrument or series of instruments to loop samples into the tunes. The closer, Bad Man was catchy in a way that wouldn’t feel out of place at a Bon Jovi show. Anticipation grew in the darkness after Rival Fire’s set ended, and people migrated from 21st Century’s bars down to get a closer view under the sometimes-rotating dancefloor. Tales were shared of previous experiences with The Butterfly Effect, and many joked about feeling much older. No one seemed to be mentioning those shows played with the new singer, though I didn’t remember if any had actually taken place. The last time The Butterfly Effect had played the venues on this tour, we’d still been in awe of the Final Conversation of Kings album, and the shows had been thick with the piped sounds of strings and orchestration. What would we be in for six years later? Emerging from the thick smoke that had covered the stage, the band emerged from their long hiatus, appearing almost monochromatic with only backlighting, we were taken right back to the first album, opening with Perception Twin before going into even older, heavier territory. When the band had split, it was amidst reports of hostility and conflicting reasonings. Tonight, however, every member of the Butterfly Effect looked to be relishing the chance to interact with one another and their audience. After the heavy opening, the move to songs from the more progressive later albums let the band really shine, Clint Boge sliding into the flamboyance he became known for, posing like Christ and leaning over the crowd beneath the stage. The gradual rise of Aisles Of White was a highlight of the night, with main set closer Worlds On Fire taking on raw a new life without the album’s production. Although the encore consists of only one song, an extended, rearranged rendition of Reach gives fans of all aspects of the band a high to leave on. After such a stellar performance, we were left wondering how The Butterfly Effect had managed to go so long without performing. Watching them pour so much energy into their performance, sounding pitch-perfect yet lively, playing so naturally one could imagine the group suffering without their art. Hopefully, as promised on stage, this is more than a one-off nostalgia tour. Last time I saw Beck, it was with a very folksy backing band. It was a good show, but I was still reeling from Midnite Vultures, and have always been disappointed that I didn’t get to see Beck in weird-pop mode. That strange arrangement that Margaret Court Arena seems to have whereby artists start performing mere moments after the time listed on the tickets for gates to open has come to pass once more this evening. It has meant that Meg Mac and her band performed for a much smaller audience than they might have if they had started once those arriving had had a chance to pass rigorous security measures, buy a drink, and settle in. It was a shame, because those dedicated few at the front of the stage and cheering from the stands enjoyed an excellent performance. Meg and the band led them in a clap-along for Grandma’s Hands, a song which showed off not only Meg, but her sister’s skills on backing vocals. Radio hits like Low Blows and Grace Gold were great to hear live, and the Like A Version cover of Tame Impala’s Let It Happen was the favourite of the audience. It was a good set that made a lot of people vow to catch a Meg Mac headline show, especially for those moments when her guitarists all trade their instruments for even more keyboards. Luckily, by the time the lights dimmed, the floor had filled up a little more, although there were still large chunks of empty seats in the stands, and sections closed down into ‘intimate mode.’ But the stage was full – crowded with a variety of instruments including an elaborate drum kit, keyboards, and an upright piano, along with seven other band members, all of which Beck himself bounded confidently through, to launch right into Devil’s Haircut. With all hands on deck to recreate the different layers of sound in the song, the band didn’t get much of a break. This was not the Sea Change tour folk show. This was a show for moving. With a backdrop of WinAmp Visualisations, Beck and his band tore through a high-energy set with a strong representation of songs from the current Colors album and also from Guero. The Guero songs in particular sounded incredible live. Also surprisingly very effective live were some of Beck’s frequent dalliances into hip-hop territory. Qué Onda Guero and especially new song Wow were unexpected set highlights that let both the audience and Beck himself exhibit their sly dance moves. On the other hand, an acoustic solo section mid set might have been intended to provide a break, but felt somewhat at odds with the theme of the rest of the show. A couple of covers, followed by a silly local version of Debra did, at least, pave the way for the lone Sea Change offering, Lost Cause, which gradually brought us back to the pace of the rest of the show, to finish the main set on a high with E-Pro. After a costume change, Beck brought his band back out to finish with with a well received Loser and an extended version of Where It’s At, interspersed with a chance for each one of the touring musicians to be properly introduced and to play a solo. In the end, it was an incredible weird-pop show. But I have still not heard Sexx Laws played live. When I first started browsing the world of podcasts, I was surprised to quickly find something that seemed so tailored to my tastes: a series focused on community broadcasting, the paranormal and new music. It seemed like a niche combination. Then the show came to Melbourne, and I walked into the lobby of the Comedy Theatre to see it filled with people who looked like me, only wearing costumes. For the stage format, rather than opening straight to the evening’s community radio show, the musical guest was introduced to begin. Erin McKeown bounded onto the stage and with only her voice and guitar created a sound as full as a whole band. Switching from rock guitar fuzz to moody blues – sometimes mid-tune – Erin had the audience singing and clapping along with her Norah Jones-ish vocals, a smile never far from her own face or that of the audience. Erin seemed to enjoy playing with the audience, inviting participation, and it looked like reflecting the spotlight onto key players in the crowd from the shine of her guitar. Whilst the applause for Erin McKeown was honest and grateful, anticipation built as MC Meg returned to the stage, wasting no time in introducing Night Vale’s resident composer, Disparition, who set himself up at a desk with laptops and a mandolin, launching into a faster version of the theme song as the star of the show, Cecil Baldwin took up his microphone to, as always, welcome us to Night Vale. Cheers filled the theatre in equal parts for his iconic speech, dulcet tones, and flamboyant suit printed all over with anime eyes. Considering the layered solo music produced by Disparition, he scored the live show flawlessly. Quickly reminding us that we are cast tonight as regular listeners of his radio show, Cecil explains that it is the night of Night Vale’s annual ghost story competition. It is a script that lets us experience lots of Night Vale stories, and importantly, to hear from lots of our favourite characters. Symphony Sanders as a more playful than usual Tamika Flynn was a highlight. Bashwiner’s corporate spokes-haze Deb took the chance to have some fun with local brands. After a parade of citizens telling ghost stories ranging, as is common in Night Vale, from the tragic to hilarious, it is time for Cecil to bid ‘Goodnight, Night Vale. Good night.’ As the cast left after their curtain call, people could be heard still emotional after the story of a ghost cat. I wondered if seeing the actors on stage would change how I pictured the characters when I next listen to the podcast. Platform One was previously known for having long queues out the front shivering in the early hours and dressed in revealing clothing. I haven’t seen it like that in several years though. Billed as an old-fashioned punk club night featuring multiple rooms, Platform One seemed like an interesting venue for a rock show. I imagined impassioned scenes within the bunker-like brick walls as a band incited good-natured chaos on the floor below a stage raised only a couple of feet. Entering shortly before midnight, the first passage was notably almost deserted, with a DJ playing club staples like My Chemical Romance and The Used in earnest to a handful of girls dancing and raising their glasses in appreciation. It is immediately apparent that, whilst it is a picturesque and central venue, Platform One is less than suited to a rock night: the music of Earth Caller is bleeding through the stone wall and overwhelming the DJ set to the point that one needs to strain their ears in order to catch the words of Misery Business. But it does mean that ordering a drink from the bar – decorated tonight with black and white balloons reading ‘Glad to be sad’ – is a simple process. After only a short break, Between You And Me play melodic, sing-along rock. With all five members getting behind microphones, the band make a sound that has the audience moving, even though it seems few are familiar with the songs. The front man in particular bounds around the stage energetically, suitable for the lead in to a band like Hellions. My previous Hellions live experience was elaborate, exhibiting the impressive Opera Oblivia backed by samples to add layers to the sound, taking their audience through all the dramatic peaks and troughs the band has to offer. Tonight was a much freer show, a straight rock show from the moment the band took the stage. Lead singer Dre Faivre gestured madly to the audience, who were pounding rhythmically in response. The energy doesn’t die down as the band power through a set mainly from Opera Oblivia and introducing new a brand new song or two. The view from beneath the stage mid-set is one of a tunnel packed with appreciative movement, and by the time the band close, the night could be considered a success. For a rock show, Platform One was a hit – sort of creepy but comfortable, easy to move but not too big as to feel empty. My initial prediction had come true in terms of the live space. However, as a club night, it seemed less successful. As well as the aforementioned sound in other rooms, the crowd seemed to disperse once the bands had finished. Of course, many may have had a long drive ahead in the morning to Unify Festival, so maybe the launch party achieved its goal. I hadn’t seen the Mavis’s since their excellent show at the John Curtain Hotel in 2014, so I was excited to see them again, but as showtime drew closer and the stage remained bare, I started to get nervous. Although even after his set, some in attendance were still unsure of who Ben Ely was, there was enough vocal reminiscing about shows of the past being shared amongst the dense audience at the front of the stage that they surely cottoned on soon enough. Meanwhile, lights were being tested, and there was still nothing on stage. No instruments beyond a couple of microphones and a keyboard. A couple of years ago I had tickets to a budget show, billed as ‘The Mavis’s Matt and Beki,’ which had unfortunately been cancelled on the evening of the show. Would this be the make-up show for that? I’d come out looking forward to a full band show! Lights flashed onto the previously blank screen before, and my concerns were addressed: Beki and Matt entered the stage alone to a surprising youthful applause from the middle aged audience, Matt carrying an acoustic guitar and Beki heading straight for the keyboard. Someone at the side of stage passed up a couple of electric guitars up to Matt who arranged them on a stand whilst Beki greeted the audience enthusiastically, though somehow, despite years of performance, seeming a little like a self conscious schoolgirl. Despite the lack of the full band, the duo managed to create a vibrant show, before projections of geniune video content, not unlike those they danced before in some of their video clips. Beki was charming, introducing almost every song as ‘her favourite,’ leaving Matt struggling for comment after reminding her she’d already named her favourite. Playing over a combination of backing tracks, loops created live, and an electronic drums that Matt somehow managed to play with sticks he made materialise between guitar chords, the sound was a full one that had more than a few of the old attendees dancing like they were at a full band’s rock show. After an absence of around fifteen years, Custard arrived for an album launch gig in Melbourne a couple of years ago, and I wondered aloud, at the launch show for their new album last night, whether this might become a bi-yearly tradition. The Stress Of Leisure (who coincidentally supported ##Shonen Knife## a few weeks ago) had also come from Brisbane for the show. I generally like bands who wear uniforms, and found myself being drawn to the foot of the stage to watch The Streets Of Leisure play in their red scarves and t-shirts emblazoned with the word ‘product.’ Their songs made me think of how a Joy Division concept album about the internet would sound if they featured guest spots from the B-52s and Spod. The support slot was serving as an album lanch for this band too, though the lack of a merchandise table meant that I didn’t get to pick up their record. I would have based on the strength of the set. It was right on 11pm when members of Custard carried their instruments onto the stage. David McCormack grabbed the microphone in what is now clearly his faux-awkward manner, and announced that it is very late to be starting a show. The predominantly older audience seem to laugh in agreement. The last Custard show in Melbourne was heavy in new material, which, while I appreciated the preview of the new album, didn’t seem to excite a lot of the audience. This show proved to be much more of a ‘greatest hits’ set, opening with Hit Song, to an excited full house. But the highlights were hearing some of the songs from 2015’s Come Back, All Is Forgiven now that we’ve had a chance to get to know the songs. We Are The Parents and especially 1990’s were fun to revisit and hear again, though it would have been cool to have slotted in a quick If You Would Like To. New songs like In The Grand Scheme Of Things and You Always Knew take cues from the alt-country flavour of Dave McCormack’s solo albums, though without the creepiness of The Truth About Love. Those people who used the new song 2000 Woman as their break to visit the bar might have regretted it, as they missed one of the rockier and catchier new songs of the set. It was initially disappointing when Dave and Glenn swapped places for the Glenn Thompson-led section of the evening to hear him announce to the band ‘We won’t play Warren Road. No one will want to hear that.’ The substitute song, Contemporary Art, made up for the disappointment, with Glenn playful as he exhibited one of the highlights from the previous album. Pascal, from Stress Of Leisure was reintroduced to the stage to provide the retro-pop key backing to have us shaking it up to the catchy ‘I want my Communism back!’ chant of the new Police Cars. After leaving the stage a few times – apparently to fix guitar issues – Matthew Strong was explained as ‘quitting the band… again…’ whilst Dave experimented with ‘all the vocal effects.’ A crowd-pleasing final part of the set covered hits, with an encore ending with Ringo, a surprisingly effective closer which had the floor moving. Hopefully after the impressive set, the hint to the band will become a fact, and we’ll continue to get a new album and tour every couple of years.